Tell them about your hearing loss. The first step is letting them know that it is hard for you to hear them. You can show them your hearing aids and explain that your ears don’t work as well as theirs do. For younger children that might be enough of an explanation, but older children will be interested in the scientific aspects. Visit websites like KidsHealth or Dangerous Decibels with them to explore how hearing works and the causes of hearing loss. Ask them to get your attention first. Explain that it is much easier for you to hear them if they get your attention first. That way you can concentrate on what they are saying and have a better chance of understanding the topic of the conversation. Knowing the context can help a lot when you need to figure out harder-to-hear words. Keep background noise low and the lights bright. Ask them to turn down the music while you talk or to move away from the air conditioning unit to minimize competing sounds. Well-lit spaces also make it easier to lipread. Teach them to take turns speaking. Children can be excited to speak and don’t know to wait their turn, but it is probably difficult for you to hear more than one speaker at a time. Remind them to take turns speaking. This is good manners in any event, and will make it much easier for you to follow the conversation. Ask them to speak at a normal volume and pace. Explain that normal speech is easier to lipread, while shouting or excessively slow speech is harder for you to understand. Clarity of the sounds is the key, so ask them to speak each word as clearly as they can rather than slurring them together. Sometimes asking them to pretend they are speaking to an audience or are onstage can help them understand what you mean. If you miss something, ask for clarification. Rather than just saying “What?” or tuning out, ask them to rephrase or spell a difficult word (depending on their age). Or ask them to point to the object in question. Repeat the part of the sentence you heard and ask them to fill in the missing pieces. Say what you think you heard — sometimes the mishearings can be very funny if you let them be. Get down to their level. Sit on the floor with them, or ask them to join you on your lap. Interact with their toys along with them. The more engaged you are with them in activities, the more willing they will be to make the extra effort to communicate. Maintain a good energy level. Communication takes work, especially when you have hearing loss. Make sure you are well rested before a visit. Eat healthy foods, try to exercise regularly and be sure to get enough sleep. Don’t be afraid to take breaks if your energy is lagging. Keep your sense of humor. 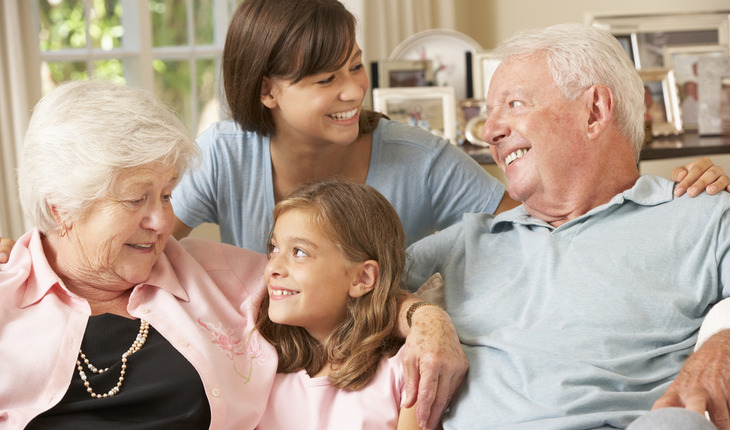 It can be frustrating, but remember the goal is to connect with your grandchildren, so why not laugh at the misunderstandings rather than being upset by them. Children are used to making mistakes and learning new words, and they will not judge you for your errors. If you are at ease with your hearing loss, they will be too. Shari Eberts is a hearing health advocate, writer, and avid Bikram yogi. She blogs at LivingWithHearingLoss.com and serves on the Board of Trustees of Hearing Loss Association of America. She is the former Board Chair of Hearing Health Foundation. Shari has an adult-onset genetic hearing loss and hopes that by sharing her story it will help others to live more peacefully with their own hearing issues. Connect with her on Facebook and Twitter.